At the start of the series, Judau and his friends are poor junk dealers at the space colony of Shangri-La in Side 1. 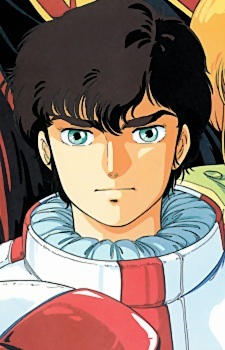 Judau is rather loudmouthed and straightfoward, but has a good heart and displays powerful Newtype abilities. He has a younger sister named Leina whom he cares very deeply for. Their parents moved to another colony to find work and they send money back to them. While scavenging for junk one day, Judau comes across the escape pod of Titans pilot Yazan Gable, who managed to survive the Gryps Conflict that concluded Zeta Gundam. Discovering that the Argama was in port at the same colony, Yazan forcefully brings Judau and his friends along to help attack the ship.